In Nassau County, it’s more than a slogan these days. The county and two of its three towns are now led by women. A number of political heavyweights were on hand on a cold New Year’s Day to celebrate a pair of novice female politicians who broke electoral barriers. With those words, U.S. 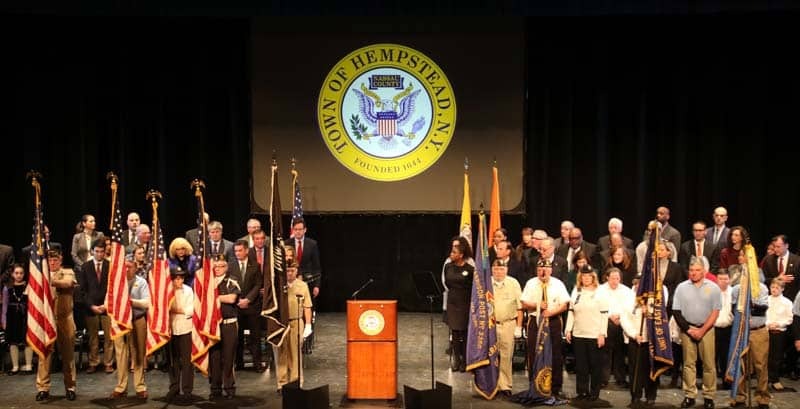 Senator Chuck Schumer summed up the significance of the occasion as well as the challenges facing the Town of Hempstead’s newest elected officials, Supervisor Laura Gillen and Town Clerk Sylvia Cabana. 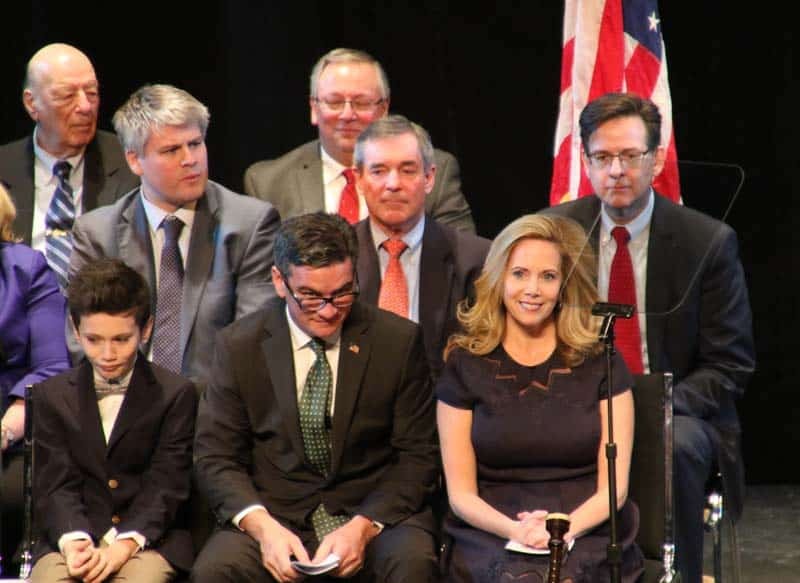 The John Cranford Adams Playhouse at Hofstra University was filled with hundreds of supporters to witness a swearing-in that crowned a surprising election season. Gillen was the first Democrat—much less woman—in more than 100 years to win the chief executive’s spot in the Republican-dominated town. Cabana is the first Democratic woman of Latin heritage to hold the clerk’s position. A number of politicians mingled on the stage before the inaugural ceremony. 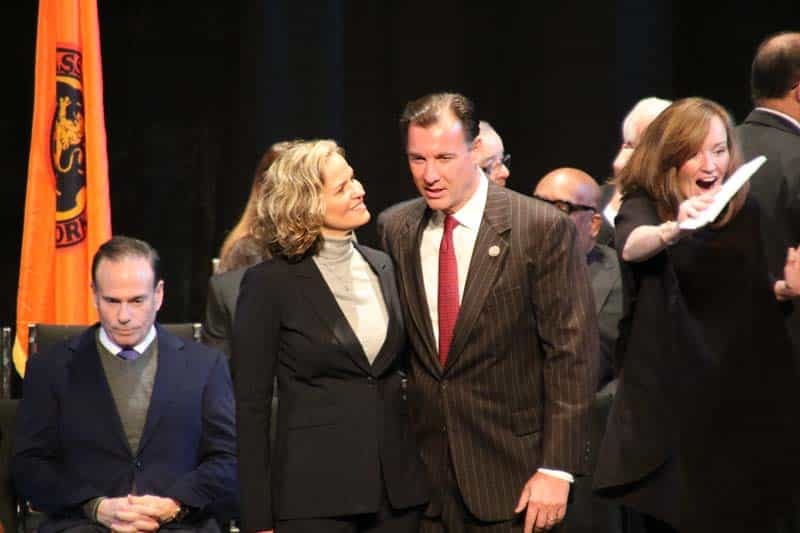 From left: Nassau County Democratic Chairman Jay Jacobs, Nassau County Executive-elect Laura Curran (her inaugural was at noon that day), Congressman Tom Suozzi (D, NY-3) and Congresswoman Kathleen Rice (D, NY-4). “Laura Gillen, you know what you’ve gotten yourself into?” lightly asked Lieutenant Governor Kathy Hochul to laughter. The state’s second-highest elected official noted that she had chaired a committee commemorating the 100th anniversary of women winning the right to vote via the 17th Amendment. “They were bold, brave and audacious women to go against their families and their institutions to win the right to vote,” Hochul said of the suffragists, going on to wonder how those pioneers would judge the progress made in our time. Cheers and applause greeted her words. Hochul praised the women on stage who were leading the fight in what she called a seismic societal shift. 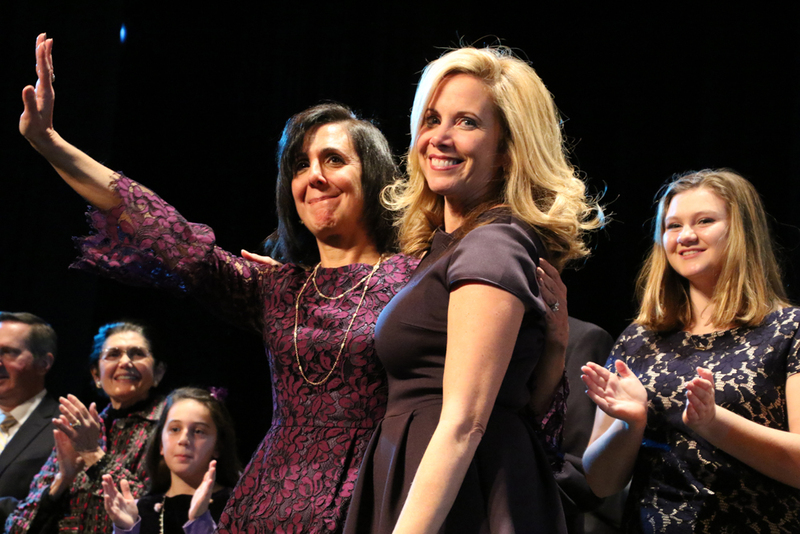 They included Nassau County Executive-elect Laura Curran (to be sworn in by Governor Cuomo later that day), the first woman to lead the county; District Attorney Madeline Singas; Congresswoman Kathleen Rice (who had been the county’s first woman district attorney); and Town of North Hempstead Supervisor Judi Bosworth. 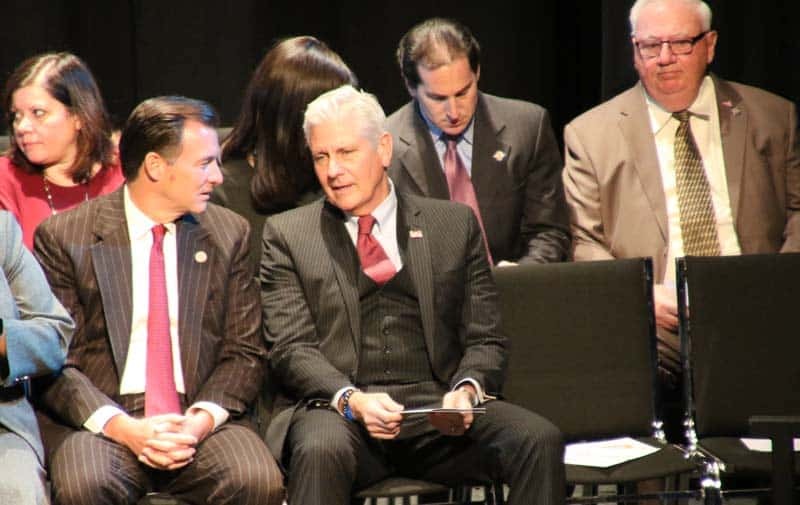 Congressman Tom Suozzi (left) chats with the most prominent Republican politician on stage, Town of Hempstead Councilman Bruce Blakeman, who endorsed Gillen for supervisor after falling out with the incumbent, Anthony Santino. Sitting in the back row are New York State Senators Todd Kaminsky (D-9) (left) and John Brooks (D-8). Hochul, Rice, Singas and Bosworth joined Gillen in a circle as she recited her oath of office. Among those looking on were Congressman Tom Suozzi and Town of Hempstead Councilman Bruce Blakeman, who crossed party lines to endorse Gillen. Representing the next generation of leaders was Arielle Isedenu of Gillen’s alma mater. Sacred Heart Academy in Hempstead, who read a long list of elected officials in attendance. Gillen, in fact, had held the same position as Isedenu, president of the Catholic prep school’s student council. Finegan talked about Gillen’s service with Mother Teresa in Calcutta, memorialized with a picture of the volunteer and the future saint hanging on the kitchen wall. Visitors ask all the time how that picture came to be taken. Laura Gillen looks on as the Nassau County Police Department Emerald Society Pipes and Drums performs. To her right is husband Chris Finegan and youngest son Austen. Directly behind Gillen is the executive director of her transition team, Brian Muellers. To his right is the transition team chair, John Westerman, a partner at the law firm where Gillen worked. In her speech, Gillen made note of the great challenge she faced in taking on the town’s entrenched Republican machine and an incumbent, Anthony Santino, who had won with nearly 60 percent of the vote in the 2015 supervisor’s race. Santino’s campaign chest dwarfed Gillen’s, and he had an army of campaign workers at his disposal while at first she relied on a small circle of family and friends. Gillen said that her family, and especially her husband, never lost their faith in her conviction that she could win. Among the many she singled out was county Democratic Committee Chairman Jay Jacobs. She called for a government that offers its services more efficiently and operates more transparently. “Starting today, we are replacing a heartless political machine with a government that puts the people of the Town of Hempstead over politics,” she said. 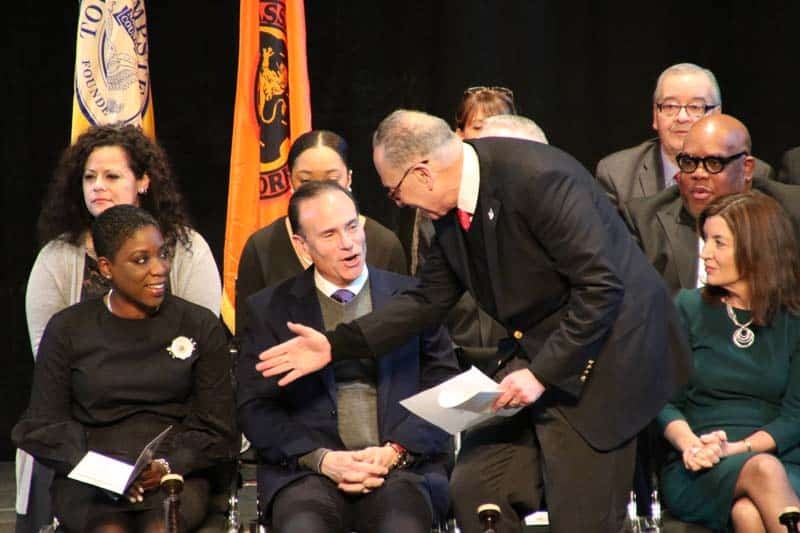 Senator Chuck Schumer greets the emcee, Nassau County Legislator Siela Bynoe, as county Democratic Chairman Jay Jacobs and New York State Lieutenant Governor Kathy Hochul look on. If education was important for Gillen (Georgetown, NYU Law School), it was crucial for Cabana, daughter of an Argentinian father and Cuban mother. The clerk-elect was introduced by daughter Julianne Smith and mother, Sylvia Torres De Cabana. The senior Cabana related that Sylvia had run for office both in high school and college, and was not surprised last year when her daughter called to tell her about her latest race. Sylvia noted that her parents sacrificed to buy a handyman’s house in Garden City in the early ’70s because they wanted her and her two siblings to attend good schools. Later, when all three Cabana kids were in college at the same time, the parents took out a home equity loan to finance their schooling. Sylvia studied at Columbia University’s Barnard College—and here she pointed to fellow alumna, DA Singas—and Hofstra Law School. “The voters have spoken. They want a government that is good, and is open and honest and accessible to all residents. And Laura and I intend to give them all that,” Cabana pronounced. She also praised her volunteers for getting out the vote. “I know that with these two women at the helm, the best is yet to come,” summed up Schumer. The Presentation of Colors was made by the East Rockaway chapters of the American Legion, Veterans of Foreign Wars, Sons of the American Legion and the Ladies Auxiliary of the American Legion. The Pledge of Allegiance was led by representatives from Camp Anchor in Lido Beach: Bryn Kirley, Matthew Vaccaro, Taneia Beverly, Dan Makar, John Molloy and Sean Michel. Angela Reteguiz sang the National Anthem. She was the winner of the Long Island Gay and Lesbian Youth Idol contest. The Invocation was given by Father Adrian McHugh of St. Barnabas Church of Bellmore. Senior Pastor Dr. David Gates of the Miracle Christian Center in Hempstead offered the Opening Blessing. Imam Abaidullah Rana of the Masjid Hamza of Valley Stream then delivered a Recitation of the Holy Koran, whose verses were translated by Malik Nadeem Abid. Rabbi Dovid Kramer, executive director of the Yeshiva South Shore of Hewlett gave the Benediction. The rabbi was introduced by Bruce Blakeman, who humorously made note that he was a fish out of water at the gathering. He pledged that the Republican majority on the Town of Hempstead Town Board would work with Gillen and Cabana, and also “outed” Gillen’s husband Chris as a fellow Republican. 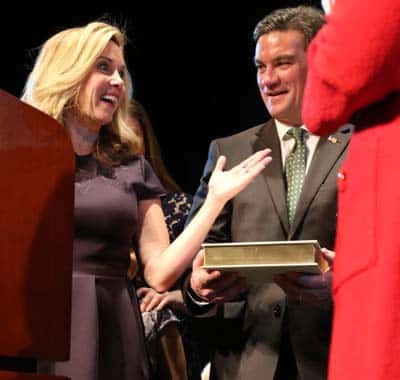 As husband Chris Finegan holds the Bible, Laura Gillen greets the women who jointly administered the oath: Lt. Governor Kathy Hochul, County Executive-elect Laura Curran, Congresswoman Kathleen Rice and Town of North Hempstead Supervisor Judi Bosworth. Laura Gillen defied all the odds. She fought and won one of the hardest fights in local government history. This victory was possible because of the support of the people in this room, but most especially, her husband Chris Finegan and her four beautiful children. It’s a great day for Laura. She got here the old fashioned way—she earned it. It’s a great day for the Town of Hempstead. This town symbolizes good middle class life. The people in this community don’t ask for much. Just to work hard, raise a family, and live a life of dignity and grace. These days it’s hard. The middle class has been neglected—here and in Washington. And that’s a very bad thing for America. And so, to have a representative like Laura, who comes from the middle class. Who lives and breathes the middle class. Who’ll fight hard for all the communities in Nassau because she is part of the middle class means that this is a great day for the Town of Hempstead. And finally, folks, it’s a great day for these United States of America. We’re the only country that for centuries has passed the torch of power peacefully. People line up on cold November nights, after getting home from work…. [to cast their ballots] and the next morning everybody abides by the decision, without tanks in the streets or rioting or anything else. It’s an amazing thing. It doesn’t have to be that way. “Look at this beautiful auditorium. It’s a cold morning, New Year’s Day. People are busy. But this room is filled with people of all different backgrounds and walks of life, different political philosophies. Oh yes, the people are participating. We have elected one our best. If Benjamin Franklin is looking down today he’d be smiling. This is the democracy the Founding Fathers wanted. Well, it happened. It took 100 years but the earth is still spinning, the sun is still shining—and I stand here today so honored—and humbled—to be Hempstead’s new town supervisor and I wish you all a very happy new year. Now to start this address and this new journey I begin with gratitude—gratitude to all those who have made this moment possible. Because initially, not many believed this moment was possible or that this race could be won. We had little money, a tiny staff and no office. New Candidates are often told that they should form a “kitchen cabinet” of supporters to help them through their campaign. Well—in my case, my kitchen cabinet operated for the most part actually sitting at my kitchen table sustained by bags of pretzels. Then as the campaign rolled on and more people embraced our message of reform, we had to add more seats to our kitchen table—along with a much bigger bag of pretzels. And then as our numbers grew larger, we met volunteers at a park in Rockville Centre—which we liked to call our al fresco office. This was a true grassroots team effort, and if I thanked everyone who contributed in some way, we’d be here all day. But I must say a few special words of thanks: Chairman Jay Jacobs, who offered me the opportunity to run this race in the first place. Thank you, Mr. Chairman, for placing your trust and confidence in me and the support you offered along the way. I thank my running mates: Sylvia (Cabana, town clerk candidate), [town council candidates] Sue [Moller] and Doug [Mayer] and the campaign staff who worked so hard to get us to November 7th, especially Lauren Corcoran Doolin, Matt Hynes, Mike Fricchione and Hunter Gross. Thank you Congresswoman [Kathleen] Rice, County Executive Laura Curran and North Hempstead Supervisor Judi Bosworth for swearing me in this morning. Legislator Siela Bynoe for emceeing this event. Thank you Senator [Chuck] Schumer, Lt. Governor Kathy Hochul and Congressman [Tom] Suozzi, District Attorney Madeline Singas and all our state officials our senators and assemblymen, thank you for joining me today, I am so grateful for your support. Thank you Councilman Bruce Blakeman for having the courage to cross party lines and endorse me. I thank Councilwoman Erin King Sweeney for the support and friendship she offered during the campaign. I thank my transition team who ushered us through to this day and in particular, John Westerman—my colleague and friend who led the team, Brian Muellers who sacrificed so much of his time and effort to help me find the best talent to lead Hempstead in a new direction. I thank Keith Corbett for interfacing with Town Hall—among many other things—finally getting my new office unlocked. I thank all those whose grassroots efforts turned the tide in this race, who knocked doors, manned (and womaned!) train stations and made phone calls on our behalf. I thank the town workers who came out to support me on their own time—despite the political and professional risk. And finally, I thank the people who are responsible for every good thing in my life my family—my parents Elaine and Bill, my siblings, James, Paul. Peter and Liz, my four children Laine, Myles, Owen and Austen and last but certainly not least, the one person who always believed in me and that victory was possible, my husband Chris [Finegan], who put 100 percent of his heart and soul into getting me through my campaign—not because he wanted to be the first “First Dude” of Hempstead but because he knew my passion for bringing change to Hempstead and he was driven by nothing more seeing his life partner succeed. Thank you, Chris for all you have done to help achieve this victory. But today isn’t really just about my victory, it’s our victory. It’s a victory for the taxpayers of our town and, on a much broader scale, it’s a victory for good government. So, as we celebrate the start of a new year, we can also celebrate the beginning of a new chapter in Hempstead’s history. This election has been called transformational. And it is. But not for the reasons you might think. It’s not just a transformation of parties or power. It’s a transformation of how people think about government. About your government. The Town of Hempstead is not about thousands of jobs, it’s about 760,000 people our government serves. One of the people I am thinking about today is my grandfather Augustus Catanzaro. Augustus sailed to America in 1914 from a small town in Calabria, Italy. He landed on Ellis Island—as young boy, 7 years old and not knowing a word of English. Who without a college education made his way eventually from Brooklyn to Baldwin and ultimately supported his family by becoming a sanitation worker in the Town of Hempstead. And now just two generations later, because of the sacrifices he and my parents made, I stand before you today a Georgetown and NYU law school graduate and now town supervisor. My grandfather came to the Town of Hempstead because he saw the tremendous opportunities and beauty the town offered, a place where he could offer his family a better way of life. And isn’t that really what we all want. What we all deserve? This race was not about Republican versus Democrat. It wasn’t a question of left versus right—but rather, right versus wrong. Town government should never be about partisan politics. It should be about practical ideas, thoughtful solutions, and competent execution. WHAT our government does hasn’t changed. But HOW our government does it MUST. Starting today, we are replacing a heartless political machine with a government that puts the people of the Town of Hempstead over politics. That’s what this election was about. Now, I love Scorsese movies. But as a town, we don’t want to be a place associated with a grim past. We want to be a town associated with a bright future. In that spirit we must move forward together, Rs and Ds, blues and reds and start building the future of the Town as partners. We need to get our fiscal house in order and replace bogus surpluses with real surpluses. We need to improve the efficiency of town services. We need to rid ourselves of rampant cronyism and backroom deals. We need to make town government more transparent and more accountable to the people. We need to move our technology into the 21st Century. Most importantly, we need to invest in people, and be invested in the concerns of our neighbors. It won’t be easy—already there have been numerous obstacles placed in our way—but we’ve known obstacles before and overcome them. I ran for supervisor because I love this town, and love my kids, and knew we could do better for them. And it strikes me—looking back at some of the things I’ve done in my life— whether it was as a lifeguard at Camp Anchor, or working with the dying in New York City or in India, or every day as a mother of four—my greatest happiness is often found in looking out for others. Of watching over people. Of taking care of them. And that’s what I’m going to do. In this new role, I promise to look out for all the people who live in Town of Hempstead…no matter what party you belong to, no matter which village you live in. And I promise to watch over this town that we all love, to be the honest steward you trusted me to be. Hempstead isn’t just our town—it’s our home. It’s our friends, neighbors, the people we see at the supermarket and on the train platform, on the school playground and in the church parking lot. It’s the people we interact with every day. People who work hard for their money and families and deserve better. Hempstead is the largest township in the United States. I believe Hempstead can also have the biggest heart in the United States. Our town should have the highest standards for public service. And together, we can make sure that the Town of Hempstead has the brightest future.